WooCommerce Product Table comes with lots of options for choosing which products are included or excluded in the table. You can display products with a specific category, tag, custom taxonomy term, custom field, date (year, month or day) or status. You can also show or hide specific products from the table based on their ID, and exclude certain categories. Please note that the options on this page can only be added directly to the [product_table] shortcode, and do not appear on the plugin settings page. 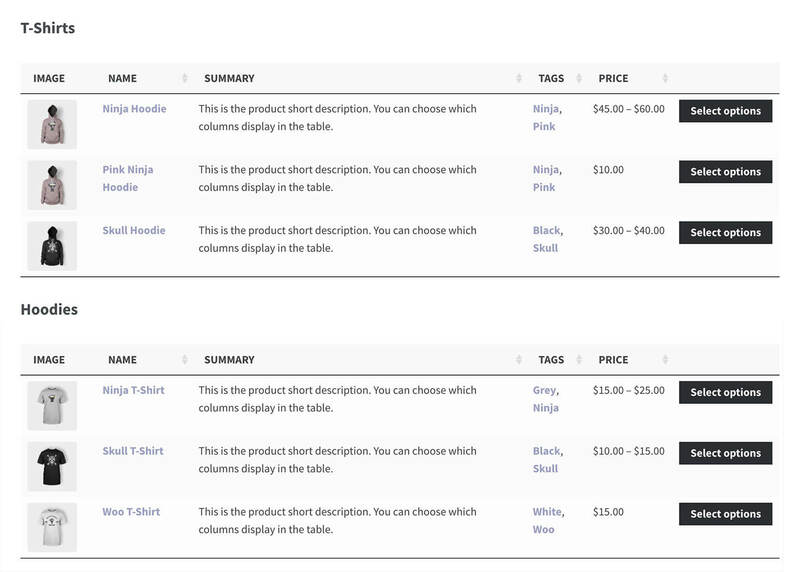 This lets you add multiple product tables to your website, each showing different products. The category option lets you display products from a specific category (or subcategory). You can use the category slug or ID. This can be found in the Products > Categories section in WordPress. You can specify multiple categories to display in the table – either separated by commas or by a plus sign (+). Using commas means “products in this category OR that category”. Using a plus means “products in this category AND that category”. You can’t mix and match commas and pluses – you have to use one or the other. Tip: If you want to use product tables for all your categories, then you can modify the category archive template to automatically use the product table layout on your WooCommerce category pages. This is easier than creating a separate page for each category, each with a different shortcode. All products are displayed in a single list, regardless of whether they are in a parent category or child category. 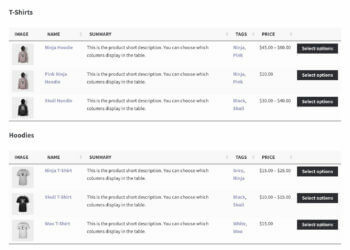 If you want to list products separately based on their category, then we recommend adding multiple tables to the page. Each table should list products from a different category or subcategory. You can divide up the page by adding the category name as a subheading above each table. The tags option lets you display products based on their tags. Use the tag slug or the ID – you can find this in WordPress within the Products > Tags section. As with categories, you can use one tag or several tags, and you can use commas or a plus sign to control the logic. Using commas means “products with this tag OR that tag”, whereas using the plus sign (+) means “products with this tag AND that tag”. You can’t mix and match commas and pluses – you have to use one or the other. The cf option lets you select products based on a custom field value. Enter it in the following format: cf="<field name>:<field value>". As with the above options, you can enter one custom field to check, or several. You can separate them using a comma or a plus sign (see categories or tags above for more details). The term option lets you display only products which have the specified term or terms. The taxonomy that you are selecting from doesn’t have to be a column in your table. Enter in this format: term="<taxonomy slug>:<term slug or ID>". You can enter one term or multiple terms, and as with categories and tags, you can separate terms using a comma (,) or a plus sign (+) to denote whether products have any of the terms specified or all of them. To list products with multiple terms, you need to separate the terms using either a plus sign (AND) or a comma (OR). If you are selecting from several custom taxonomies, you need to add the taxonomy slug before each term. By default, WooCommerce Product Table works with text-based custom taxonomy terms, e.g. ‘coats’ or ‘shoes’. If you are using numeric taxonomy terms, then you need to add numeric_terms="true" to the shortcode. You can also use the term option to list products with a specific attribute value. Add pa_ before the attribute name, followed by a colon and the attribute term(s). Please note that you can only use this method to list products based on their global attributes, which you create under Products -> Attributes in the WordPress admin and then select for each product. It’s not possible to list products with custom attributes that are created directly on the Add/Edit Product screen. The month option lets you display products published in a specific month only. You should use a number here between 1 and 12. The day option lets you display products published on a specific day of the month. You should use a number between 1 and 31. The status option controls which products are displayed based on their post status. The default status is “publish”. The other options are ‘draft’, ‘pending’, ‘future’, ‘private’ or ‘any’. Pending products are those pending a review. Future posts are those scheduled to be published at a future date. Private posts have their visibility set to Private which means they can only be viewed by the original author or other administrators. See also: How to automatically expire products and remove them from the table on a certain date. The exclude option lets you exclude products from the table based on the ID. You can enter one ID or a list or IDs. The include option can be used to show only specific products in your table. You can enter one product ID or a list of IDs. Please note that include and exclude are mutually exclusive – if you set one, the other will be ignored. The exclude_category option is used to exclude entire categories of products from your table. You can use category IDs or slugs, and it can be one category or a comma-separated list. You may wish to create a product table listing the variations for a specific product. For example, this might be useful if you wanted to add a table of variations to the single product page for each product. See this shortcode in action on this product on our demo site. We also have a separate article with more guidance on showing product tables on the single product page. There are 2 ways to hide out of stock products or variations from the table. Use the first method if you want to hide out of stock products globally throughout your store; or the second method to create a product table that only shows ‘in stock’ products without hiding them from the rest of your store. Tick the ‘Hide out of stock items from the catalog’ box in the WooCommerce settings. Find this option at /wp-admin/admin.php?page=wc-settings&tab=products&section=inventory. WooCommerce comes with a custom field meta key that you can use to only show ‘In Stock’ products in the product table. To do this, add cf="_stock_status:instock" to your product table shortcode. Please note: Method 2 only works for simple products, and not out of stock variations. Products and variations with a stock status of ‘On backorder’ are treated in the same way as ‘In Stock’ products. It’s not possible to display them separately from products that are in stock. Please see our separate article on backorder products and variations. It’s also possible to create product tables listing your most popular or bestselling products, based on the number of sales. Please see our full tutorial on how to do this. Unfortunately there’s no automatic way to show discounted/sale products in the table. This is because WooCommerce doesn’t store this information as a taxonomy or custom field that you can display using WooCommerce Product Table. Mark your reduced price products as ‘featured’ and use these instructions to list them in the table. If you want to use featured products for something else, then you could also create a custom taxonomy (instructions here) and use it to tag products that are on sale. You can then use the term option to show on sale products only. WooCommerce Product Table doesn’t have a feature to list products based on price. However, you can achieve something similar by using the price filter that comes with the plugin. Instead of linking to a normal page with a product table, you need to link to the URL of a table that is pre-filtered by price. There are instructions on how to do this in this article.